NORTH SIOUX CITY – Dakota Valley locked down defensively Friday evening and came away with a 62-31 Dakota XII Conference win over Canton. The Panthers, playing their home and conference opener, held the visiting C-Hawks without a field goal for over 10 minutes between the second and third quarters in moving to 3-0 overall. Peyton Wingert, a 5-foot-10 senior, led the way for Dakota Valley with 24 points, her second game of 20-plus points this season. Wingert had 13 in the first half as the Panthers took a 26-14 led into intermission. Morgan Tritz, a 5-6 sophomore, chipped in 10 points while Madisyn Heeren, a 5-10 senior, added eight points and 11 rebounds. 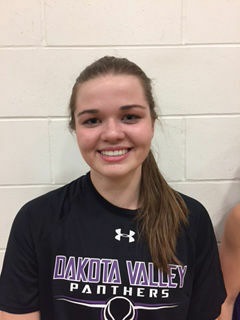 Dakota Valley outrebounded a smaller C-Hawks (0-3) team 47-36 as Alyssa Johnson, a third senior starter, pulled down nine missed shots and Wingert had seven. The task gets bigger for the Panthers as they face a game against top-ranked (Class B) Warner at 4:30 p.m. on Saturday at the Sanford Pentagon. Warner was a state tournament qualifier a year ago. It will be the final game before Christmas break for Dakota Valley, which opens its post-Christmas slate against second-ranked (A) Lennox, the state runner-up last winter. Mason Tieszen had 11 points and Jada Lundstrom 10 for Canton, which struggled from the field, hitting 15 of 54 shots in the game. LAST DAY TO VOTE: Pick your favorite photo in our Destinations Travel contest! First prize is $1,000; the contest voting period ends Monday, July 23, at 11:59 p.m. CDT.